When a user clicks on a map what should they expect to see? I would say a symbol for where they clicked. A pushpin seems to be the most accepted icon for generic data. Google has pushed the upside down tear drop. What are other ideas/options and is there a place for finding professional gis oriented icon packs? 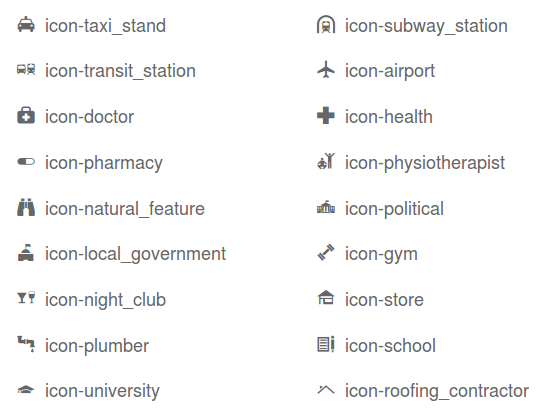 Scott de Jonge has released a fantastic icons font library (named Map icons) under SIL OFL / MIT Licence. Icons are available at http://map-icons.com. As any icons font, map icons are scalable and are easy to style (size, color, etc.). The original SVG file is also available as source into the github repository. Individual SVG source files are available in a specific github repo. Mark James Silk icons have been geo-processed to build geosilk icons set. The Emergency Mapping and Crime Mapping Symbols sets are available. While the symbols have been created for specific needs the diversity of the symbols means that members outside the emergency and crime mapping community have found value in the symbol sets for their own applications. The symbols have been created in PNG formats to allow for importation into existing GIS software or to be used in Web-Mapping applications. Have a look on http://www.sjjb.co.uk/mapicons/ It's a CC0 licence. I was just reading an article that mentioned that Google Maps created a set of "icons [that] are familiar and understandable to people throughout the world based on the international set of pictographs created by the AIGA." "The complete set of 50 passenger/pedestrian symbols developed by AIGA is available for all to use, free of charge. Signs are available here in EPS and GIF formats. Additional symbol signs are available free of charge at The Noun Project." The icons are downloadable at the link provided. There's also the symbolstore - made in conjunction with Penn State University. Contrary to the name, the icons are free. They contain icons from various projects including maki,noun project, and others that users have contributed. Users are also encouraged to add their own creations as well. IconFinder has a lot of icons including mapping ones. But it's not exclusive to web mapping. Not the answer you're looking for? Browse other questions tagged symbology web-mapping or ask your own question. Seeking free map icons sets? Are there any icons for GIS mapping? Seeking pretty icons for GIS development? Where to find Icon library for custom GIS software? Seeking beginner web mapping advice? How to create an interactive web mapping site with comment/rating system? What technology to use for an Interactive web map? Web Mapping with Select by Rectangle and Modify Symbology? Interactive Web Mapping for a Non Programmer? Seeking symbology (.lyr?) for USGS geologic maps? Determining how interactive web map was created?